Preparing for Your Commencement, May 9. 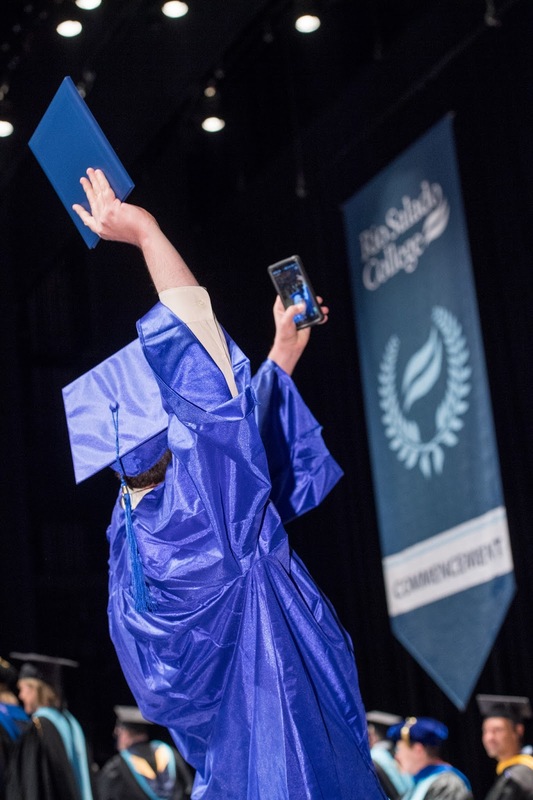 Are you ready to celebrate your achievements at Rio Salado’s commencement ceremony on Wednesday, May 9? Please refer to this event page and event flyer for the latest details. Here are a few things to keep in mind as you prepare for your big night. The ceremony will take place at the Comerica Theater, located at 400 W. Washington St. Phoenix, AZ 85003. Students should arrive and register at the Comerica Box Office entrance door on 4th Ave beginning at 5:45 p.m. 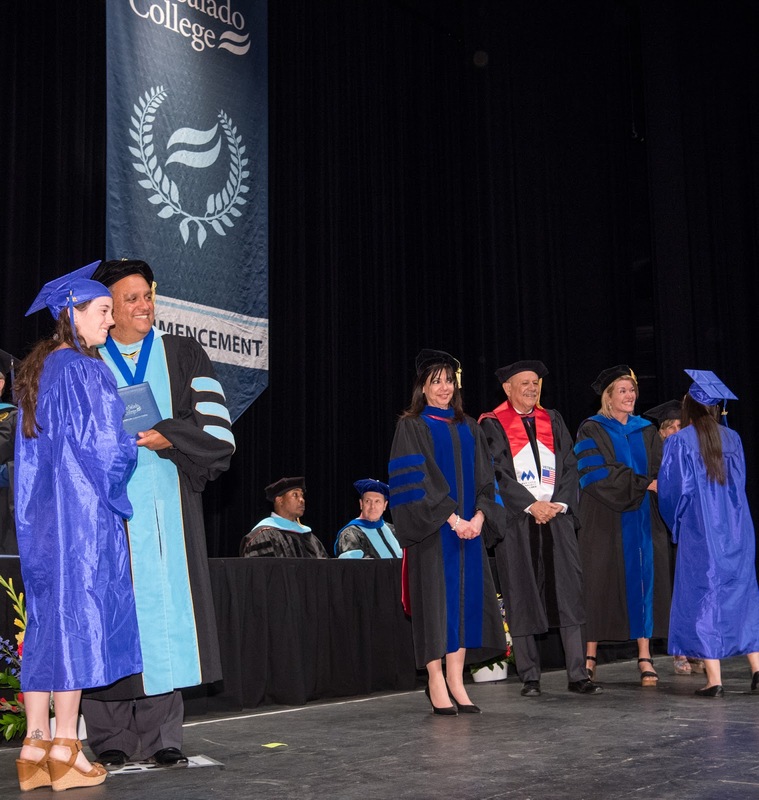 Lobby doors will open for guests at 5:30 p.m.
Students can pick up their cap and gown between now and May 9 (before noon) at the Rio Salado headquarters in Tempe. 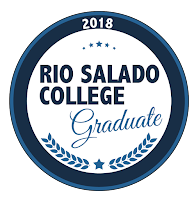 For more information contact 480-517- 8540 or graduation@riosalado.edu. Download and share your favorite grad badge. You have three options. This selection is trending as a favorite pick among Rio Wave grads. GradImages will take photographs of graduates receiving their diplomas and when they exit the stage. Proofs of these photos will be made available at www.gradimages.com and can also be purchased directly from GradImages by calling 800-261-2576. Please email inquiries to giservice@gradimages.net. We will post event photos in the coming weeks via our Facebook account. You are welcome to tag, download and share these photos. 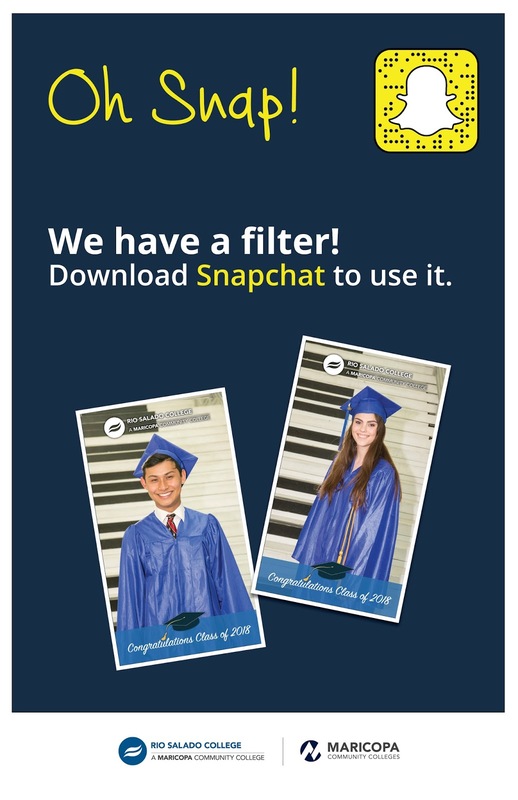 Share your stories, smiles and celebrations using #RioGrad #RioWaves or by using our Snapchat grad filter at Comerica Theatre on May 9. 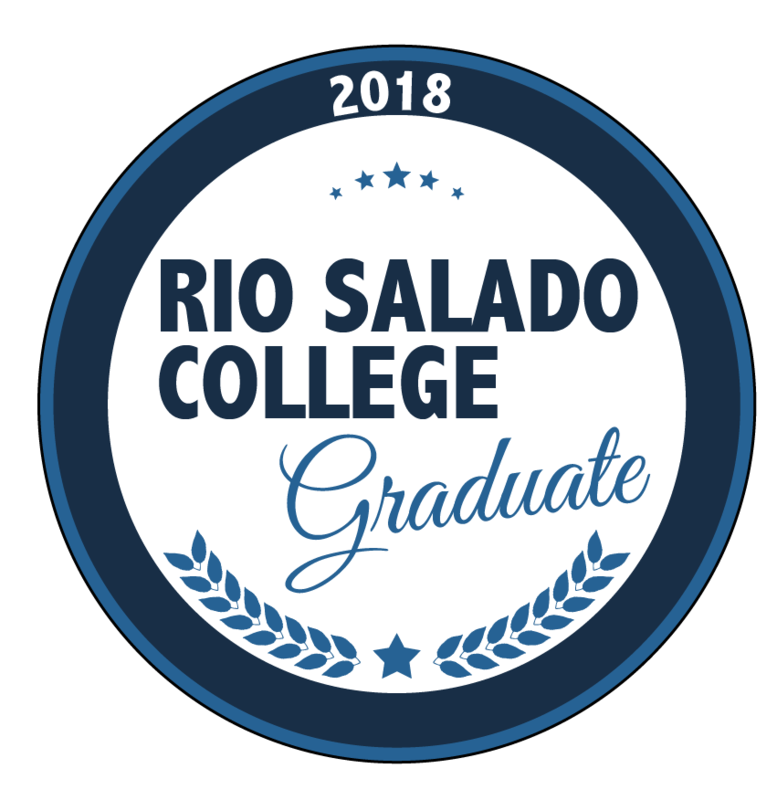 Here’s to Rio Salado 2018 Graduates! 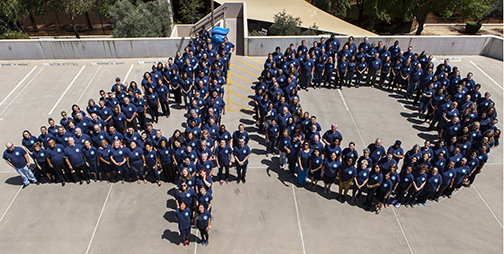 As part of Rio Salado College’s 40th anniversary celebration, more than 200 employees gathered at the Tempe headquarters for a photograph-- sporting their new anniversary t-shirts and assembled as a human 40 formation! Included in the festivities was Rio Salado mascot Splash, who cheered the team on as they took their places. Enjoy this behind-the-scenes video of the making of this commemorative photo. Visit www.riosalado.edu/40 for the latest news about our 40th anniversary celebration. Here's to Celebrating 40 Years as an Innovative Leader in Higher Education. Labels: AdvisementNews, LifeAtRio, LiveAtRio, RioCommunity, RioEmployee, RioGrad, RioLearn, RioLocal, RioLounge, RioNews, RioStudents, RioStudents. Rio Salado’s Phi Theta Kappa (PTK) chapter is partnering with the Andre House of Arizona to host a donation drive for people in need, April 30–May 19. Among the top priorities is collecting reusable (hard plastic) water bottles, which are more sustainable than recyclable water bottles, and also offer storage for leftover food or vitamins. Multi-vitamins, cough drops, ibuprofen, aspirin, etc. Donation bins are located at the Rio Salado Tempe Tower lobby and near the rear entrance of the Rio Salado Tempe Hohokam building. We appreciate your contributions and generosity. 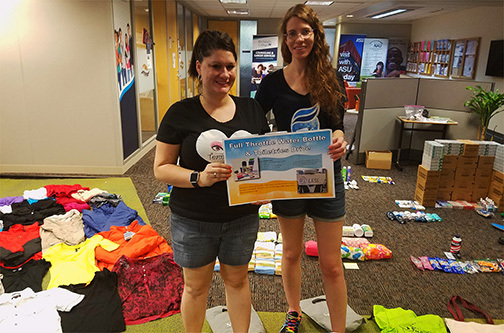 Pictured above are Rio Salado PTK students Evea Morrow and Crystal Roberto sorting through 2017 donations. 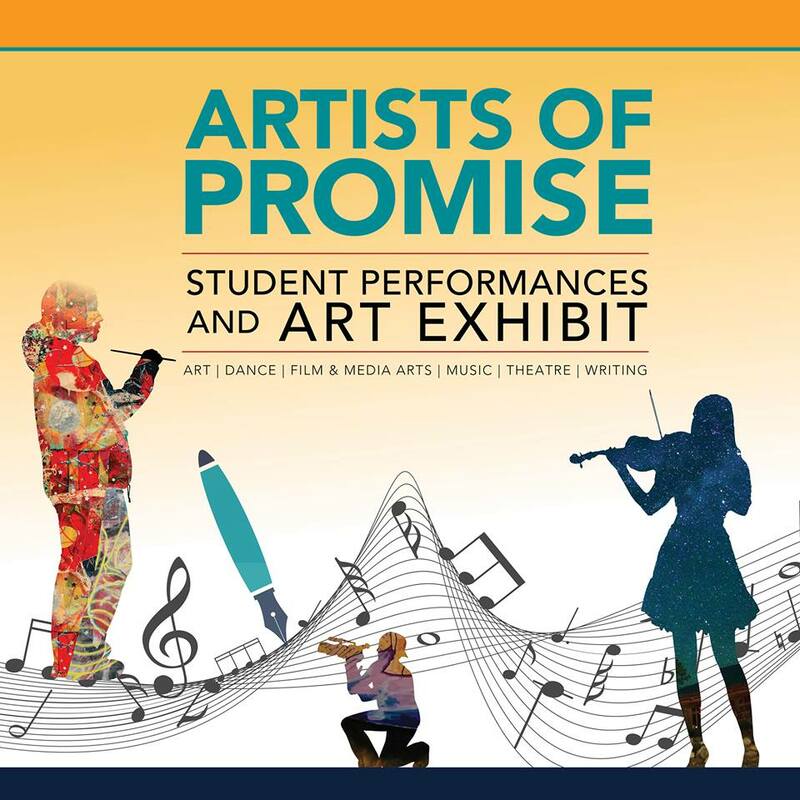 The Artists of Promise gala and exhibition is tonight! This is the night when students from all across the Valley get to showcase their finest artistic works-- and for us to honor the recipients of the Maricopa Community Colleges Chancellor Award in creative writing, dance/choreography, film/media arts, music composition, music instrumental, music vocal, theater design, theater performance and visual arts. You can also tune in for a live stream of the event, courtesy of Maricopa Community Colleges Television, beginning at 6:30 p.m.
Labels: AdvisementNews, LifeAtRio, Lifelong Learning, LiveAtRio, RioCommunity, RioEmployee, RioGrad, RioLearn, RioLocal, RioLounge, RioNews, RioStudents, RioStudents. 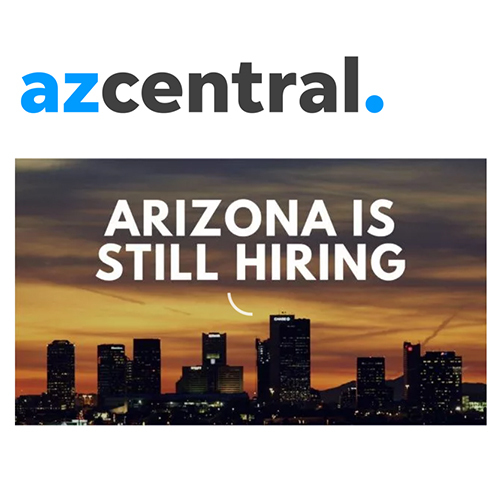 Check out this azcentral.com story to learn how Valley employers are providing recruitment incentives, including professional growth opportunities to create a loyal, highly-skilled workforce. 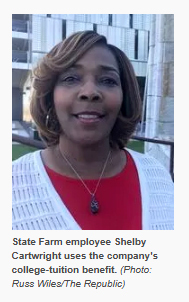 Included is a reference to Shelby Cartwright, one of 250+ State Farm employees in the Phoenix area who uses company-paid tuition for courses at Rio Salado College. Rio Salado collaborates with the Maricopa Community Colleges, Maricopa Corporate College, local and national industry leaders to develop certificate and degree programs that help students improve their chances of attaining gainful employment— by focusing on industry needs and skillsets in demand. 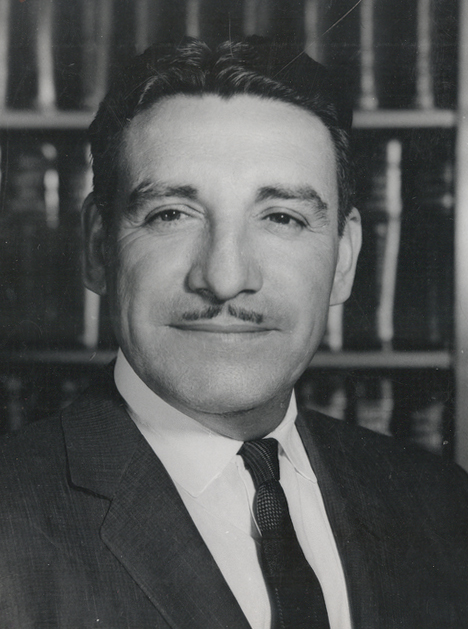 The Maricopa Community Colleges (MCCCD) is pleased to announce a scholarship in honor of the Honorable Raúl Héctor Castro, the first and only Mexican-American Governor of Arizona. This new scholarship will be available for the fall semester of 2018 to underserved Latino students interested in occupational programs and skilled trades who are enrolled in either Associate of Applied Science (AAS) or Certificate of Completion (CCL) programs. Approximately 33% of MCCCD students identify as Latino. Many are nontraditional and/or first generation college students. Currently, $40,000 is available in this scholarship fund. Of that, $20,000 is a matching gift from Chicanos Por La Causa, Inc.
“Chicanos Por La Causa is committed to empowering individuals toward self-sufficiency. Education is an important vehicle that provides this empowerment. I am particularly excited to be a part of the MCCCD Raul Castro Scholarship, which offers pathways toward certification for highly skilled jobs or a foundation to transfer to a four year university,” states David Adame, President and CEO at Chicanos Por La Causa, Inc. The Honorable Raúl Castro served as Governor of Arizona from 1975 to 1977. During his career, Governor Castro held both elected and non-elected public offices, including Pima County Attorney and the United States Ambassador to El Salvador, Bolivia and Argentina. He received all of his formal education in Arizona attending Arizona State Teachers College and earning his Juris Doctor degree from the University of Arizona. “My father was a trailblazer who valued education. He believed that we are obligated to provide opportunities for our brothers and sisters. This is one of several scholarships in my father’s name and our family is excited to support Maricopa’s Latino students for many years to come,” said Beth Castro daughter of Raúl Castro. More details about the Raúl Héctor Castro Scholarship application process will be released in the near future. 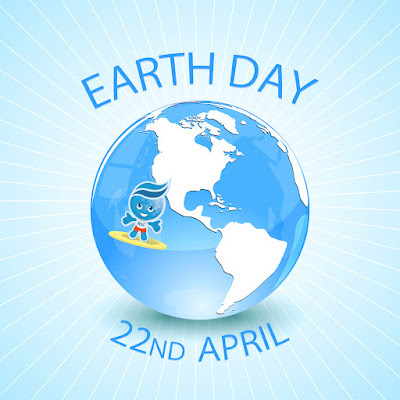 Celebrate Earth Day-- Every Day! Earth Day is celebrated each year on April 22 in support of environmental protection. The movement began in 1970 and is now celebrated by more than one billion people around the globe-- making it the largest civic observance in the world! Learn more about the history of Earth Day, the impact it has had and what the movement is trying to do today by visiting www.earthday.org. 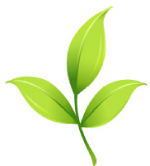 Rio Salado College is committed to its Sustainability Pledge. The college has incorporated sustainability as a core value and has developed several programs and practices that embrace the sociocultural, environmental and economic facets of sustainability. It’s not just a matter of teaching others how to be sustainable-- Rio Salado strives to be a leader in environmental responsibility by incorporating earth-friendly practices throughout its daily operations. We hope you will join us in this effort. 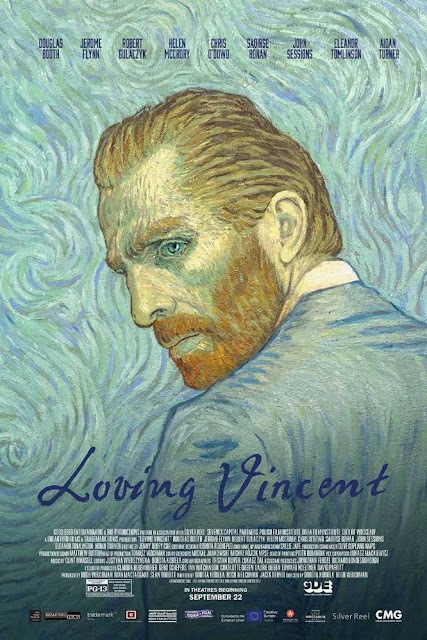 Check out the latest in fiction, nonfiction and DVD releases from the Rio Salado Library, including blockbuster movies like Get Out, Loving Vincent and Murder on the Orient Express! 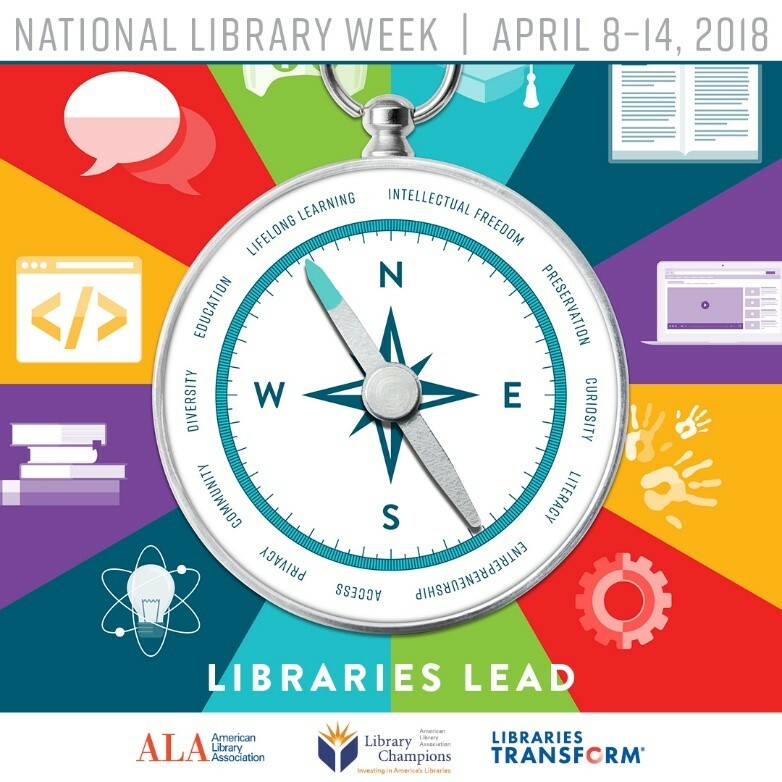 This is a free service for Rio Salado students and staff. You can arrange for free pick up and drop off at Rio Salado locations across the Valley. Let us know if you have a special request by calling 480-517-8424. Dream and Legacy: Dr. Martin Luther King in the Post-Civil Rights Era by Michael L. Clemons, Donathan L. Brown, and William H.L. Dorsey, eds. Faith and Resistance in the Age of Trump by Miguel De La Torre, ed. 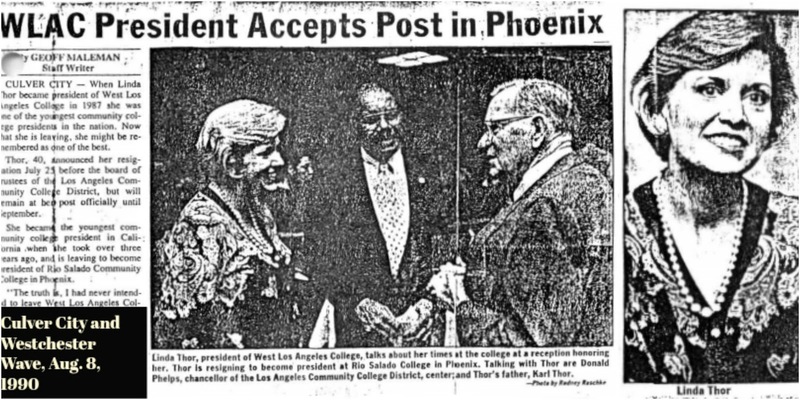 Check out this azcentral story and discussion with news staff about how to get an Arizona university degree for less money. 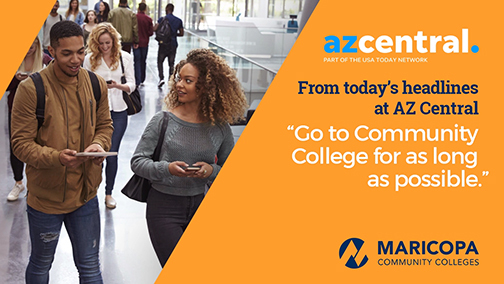 Rio Salado and the Maricopa Community Colleges are ready to help you make the most of your time, money and passion-- with online options, flexible Monday starts, seamless transfers and more. We look forward to being of service to you! 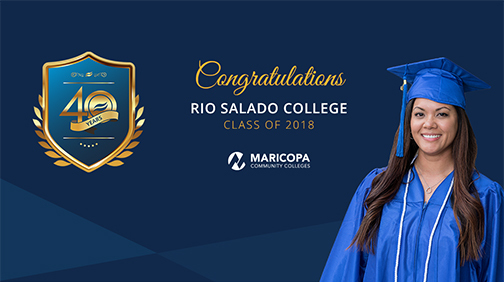 Here's to Rio Salado College 2018 grads! We look forward to celebrating your accomplishments at our 2018 commencement ceremony on Wednesday, May 9, at Comerica Theatre. Pictured above is this year's student speaker, Jamie Peredo, an honors graduate of Rio Salado’s dental hygiene program. You'll be hearing more about her soon! Check out this event page for the latest details on how to prepare for our commencement ceremony and to download your 2018 Grad Badge. We also encourage you to join us for Maricopa Community Colleges convocations to celebrate your accomplishments. What is a convocation? 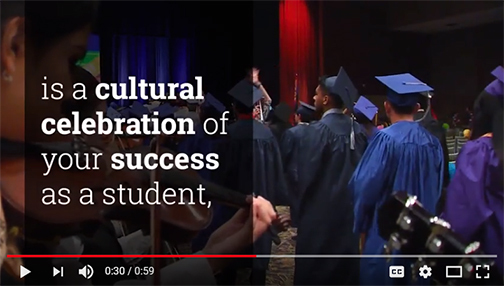 Watch this video to learn more and then visit events.maricopa.edu/event/2018-convocations. Free Urban Nocturnes Performance Today at Noon! 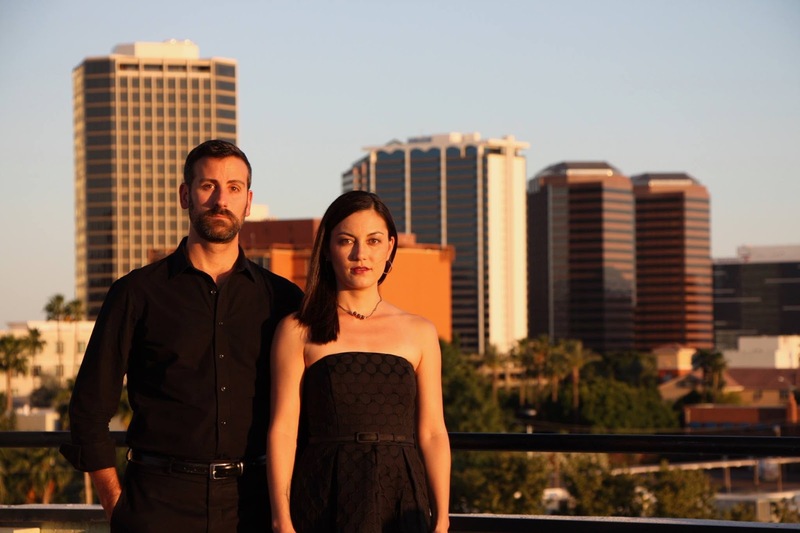 Join Rio Salado's Honors Program for a free concert performance featuring Urban Nocturnes at the Rio Saldo Conference Center today, April 17 beginning at noon. Urban Nocturnes is a chamber group with the Phoenix Symphony, founded by Karen Sinclair, violin, and Christopher McKay, viola. They are Artists-in-Residence at Trinity Episcopal Cathedral in downtown Phoenix as well as full-time members of The Phoenix Symphony. Join KJZZ 91.5 FM for EXPLORE ARIZONA StoryFest and Expo at the Mesa Convention Center on Saturday, May 12, from 10 a.m. – 4 p.m. The family-friendly event will showcase some of the state’s most animated storytellers and features booths from popular and unique Arizona destinations. KJZZ’s mobile studio and food truck Soundbite will also be on hand. Tickets are $10. Children 13 and under are free. The event benefits Sun Sounds of Arizona and is presented in partnership with the Arizona Storytellers Project and South Mountain Community College's Storytelling Institute.